A Commission with the Philadelphia Orchestra Announced.. Featured Guest Solo Artist for the 2018 Colorado Flute Festival, the 2019 Mid-South Flute Festival, performing her own music at the Gala concert and other performances at the National Flute Association's convention in Orlando, two world premieres commissioned by Carnegie Hall, a brand new work for flute and piano commissioned by New Music Flute Consortium and more! Stay tuned.. Featured Guest Solo Artist for the Mid-Atlantic and New Jersey Flute Fairs, Coleman performances of her own music at the 2018 National Flute Association's convention in Orlando, a New Zealand tour, residencies at Chamber Music Northwest and a Visiting faculty position at the University of Chicago. Commissions in progress: Phenomenal Women - a Concerto for Imani Winds & ACO (American Composers Orchestra), a wind chamber work for the University of South Carolina, solo flute works for Flutist Allison Loggins-Hull, and also The National Flute Association. Premiering collaborations include David Shifrin and Harlem String Quartet for “Shot Gun Houses”, a new clarinet quintet based on the life of Muhammad Ali. Valerie named one of the Top 35 Female Composers in Classical Music by Anne Midgette of The Washington Post. (8/5/17) Valerie was recently listed by the Washington Post as one of the "Top 35 Female Composers in Classical Music". The 'best of' list is what critic Midgette describes as "based on a combination of personal preference and some idea of what constitutes “importance,”.."
WINNER OF 2017 Herb Alpert/Ragdale Residency and Prize! Summer 2017: Featured Composer & Flutist at Chamber Music Northwest! Valerie Coleman was a featured artist this summer at Portland's esteemed Chamber Music Northwest as a performer and composer. 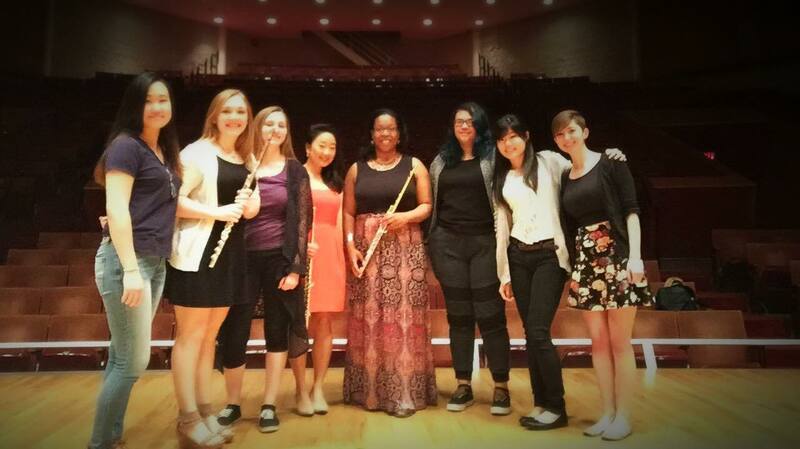 Coleman's new work for winds and piano premiered on May 3rd, 2017 as part of Imani Winds' residency at the University of Chicago. Commissioned by University of Chicago Presents and Imani Winds, BRONZEVILLE celebrates the life of Gwendolyn Brooks, featuring three of her most notable poems set to incidental music. New in the V Coleman Store! Freedmen of the Five Civilized Tribes, premiered by DaCapo Chamber Players in 2012. Coleman creates a vividly colored, 'big country and open sky' soundscape for Alto Flute, Clarinet, Violin, Cello and Piano. A musical hybrid of Native American and African cultures, "Freedmen" honors the legacy of former slaves who were adopted into the Cherokee, Creek, Choctaw, Seminole and Chickasaw nations through emancipation or marriage. Written for the Flute and Clarinet Consortium, Portraits of Langston is a dramatic, sometimes humorous work for flute, clarinet and piano with optional narrator. For advanced performers, the sheet music is now available for purchase as a digital download. Valerie Coleman's first work for flute and piano, Wish, was inspired by and titled from poet Fred D'Aguiar's work. Wish is a dramatic tone poem for flutist and pianist alike, depicting the Middle Passage in which Africans were trafficked across the Atlantic by tall ships to be sold into slavery. The virtuoso 12-minute journey is a powerful recital work, expressive and with thrilling impact. For advanced performers. Sonatine is an 8-minute recital work in one movement inspired by Coleman’s travels throughout Europe, most notably while touring with jazz icon Steve Coleman. The work is reminiscent of a performance at a nightclub, where players wailed soulful tunes and riffs on a lovely summer evening in Berlin. Sonatine starts on fire, and thrives with intensity, rhythmic drive, and drama for both clarinetist and pianist. For advanced performers. Rubispheres for flute, clarinet and bassoon is a series of unique, hip trios that depict urban nightlife. Now heard on Sirius XM Radio's Symphony Classical station, the performance features the composer on flute, Mariam Adam on clarinet and Monica Ellis on bassoon. The sheet music is now available for purchase as a digital download.